You can target 1 "Superheavy Samurai" monster you control; equip this monster from your hand or field to that target. It gains 400 DEF. 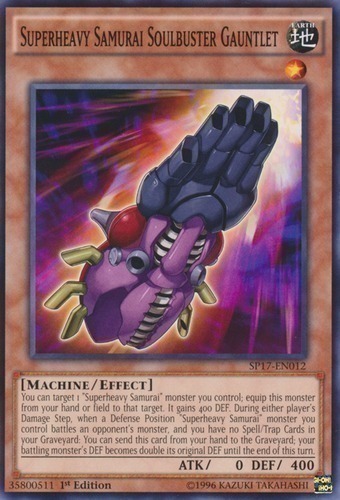 During either player's Damage Step, when a Defense Position "Superheavy Samurai" monster you control battles an opponent's monster, and you have no Spell/Trap Cards in your Graveyard: You can send this card from your hand to the Graveyard; your battling monster's DEF becomes double its original DEF until the end of this turn.